When refilling your tires, it is important to accurately discern the level of capacity in the tires before inflating them. Not doing so may cause your tires to be overinflated, which is ultimately counterproductive to filling them up in the first place. With an accurate tire pressure gauge, you can carefully monitor your pressure levels to ensure that they also do not become too low, which can lead to wear and tear on your rims and a lack of quality performance. Therefore, it is important to have a quality gauge on hand at all times to ensure that your tires remain at optimal levels. How long do batteries last, and is it easy to replace them? Is this device for valves only, or can it be used with Presta valves on bicycles? Does the reading stay lit when removed from the valve, or does it immediately shut off? Does this work on 18-wheeler tires? How is the LCD readout in bright sunshine? Is there a way to connect this product to a 12-volt tire inflator instead of an air compressor? Can I deflate my tires with this tire pressure gauge? Can I use this product on RV tires? What hose do I need to connect it to for my RV? Can I use this as a gauge only? Without using an air hose? The AstroAI digital tire pressure gauge provides you with everything you need to monitor your tire pressure. The product is designed to help you maintain correct tire pressure, reduce tire wear, and extend tire life. The product comes with a digital display reading that is instant and clear, so you’ll no longer have to do the guesswork to figure out complex measurements. The AstroAI comes with a variety of nozzles that easily form a seal with the valve stem, allowing the product to give quick and accurate readings. Using the gauge is as simple as turning it on and selecting the range. What’s really convenient is that it automatically shuts off after thirty seconds to save power. The gauge comes with a non-slip texture that makes it easy to hold onto, and the ergonomic design is suitable for both men’s and women’s hands. Digital Display – There is nothing worse than finding yourself with a leaky tire after the sun has set and having to accurately measure tire pressure with only dim light from a phone or flashlight. Thanks to this device’s digital display, you won’t have to worry about this unnecessary complication. Quality Product – The AstroAI comes with a one-year warranty with a battery included. The product is versatile too, working with cars, trucks, motorcycles, and bikes. Accurate Readings – The AstroAI digital tire pressure gauge is designed to help you maintain correct tire pressure by eliminating the guesswork involved with analog gauges. Plus, using the device isn’t cumbersome, so you’ll be comfortable when you’re using the device. High Value – For the price of what you are paying, you’ll be pleased with the quality of the product. While it might appear like a cheaper piece plastic, it’s actually a highly effective piece of equipment that is designed to maximize your automotive investment. Battery Life – Some have complained about the battery life, which can be frustrating when you’re on the road and encounter an emergency. Fortunately, the battery is easy to replace, but it’s a good idea to keep a spare one in your car along with the gauge. The tool provides four settings with a range of 0-150PSI/ 0-7 Bar/ 0-7 Kgf/cm or 0-700KPA. It is important to note that in order to get a good seal, you’ll need to put the tire’s air nozzle up or off to the side. It is best when the nozzle is around six or seven o’clock positioning so that you can firmly press the gauge straight down and read the measurement by tilting your head slightly. Always remember the most important thing for you is to be able to press down straight and hard onto the tire’s nozzle. In many instances, the battery lasts about one year, and all you have to do is unscrew the device to replace the battery. No, it cannot be used with Presta valves, but it can be used with Schrader, or American, valves. It stays lit for a short period of time, about ten seconds, and then the product automatically shuts off to save power. The readings are rounded to .5 lbs psi. It is not a perfect system, but it is good enough for everyday driving purposes. As long as the tires typically use less than 150 psi, then you shouldn’t have any problems using this device. The most important aspect is the length since you need to be able to reach the inflating valve with little effort. Excellent. It has a blue backlight with black numerals, so viewing in sunlight should not be a problem. The device requires a 3-volt battery, but batteries come installed so that the device is ready to use immediately. If you are looking to maximize the lifespan of your tires, then you need a way to accurately monitor their pressure. Without the ability to do this, you run the risk of driving out on deflated tires, which can be dangerous. With the AstroAI digital tire pressure gauge, you will benefit from the ability to quickly and accurately monitor the pressure of your tires so that you can keep your vehicle in good repair. Use the gauge when you need to check if it is time for a tire rotation or refill, or use it in an emergency. One of the best characteristics of this gauge is that it’s easy to use. All you have to do is insert the nozzle and press a few buttons to receive an up-to-the-second reading. You will be confident in the measurement and amazed at how fast and effective this product is at keeping track of your air pressure. 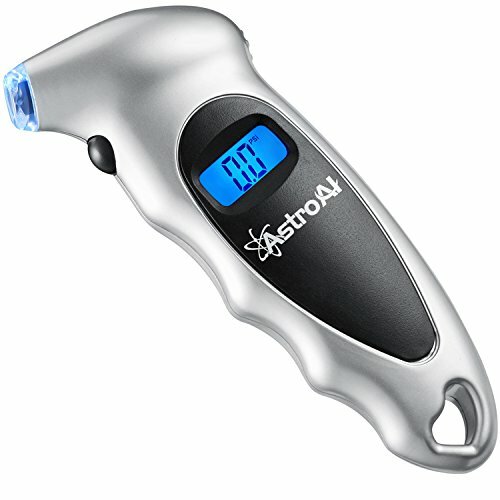 The AstroAI digital tire pressure gauge is a product that can be used for a wide variety of needs beyond tire pressure. Use this product as your go-to solution to keep track of your automotive investment. If you are looking for a fast and effective way to quickly monitor your tire pressure, then look no further. Without having an accurate read on your tire pressure, you are subject to many complications that can jeopardize the value of your automotive investment. By effectively tracking this pressure, you can prevent tire deflation and avoid flats misalignment. If you are tired of having to go to the mechanic to check your tire pressure only to be upsold on services that you may or may not need, then do yourself a favor: Purchase a digital tire pressure gauge so that you can check your tire pressure yourself—without all the hassle and money spent on having someone else check it for you. Great Value – The Exwell is a product that will be certain to deliver you the high-quality performance that you are looking for when purchasing a digital gauge. When stacked against its competition in terms of pricing, it is right on par and offers the reliability that you need. Durable Product – The Exwell comes with a three-year support warranty, so you’ll be confident in your purchase. Three-in-One Function – The Exwell is unique because it offers three functions in a single package. The product has the ability not only to check your tire pressure but also to connect to its built-in air pump to inflate the tire. The Exwell also comes with a deflate feature if the tire has too much pressure. Possible Leak – Some customers have complained about the product having a leak, thus causing the gauge to fill up the tire slowly and ineffectively. As such, it might not be best in times of emergencies, and daily use might not be appropriate. With the Exwell gauge, you’re in good hands. The digital tire pressure gauge allows a wide range of measurements between five to 150 psi. The digital backlight readout provides an easy-to-read display, even by night. The Exwell tire gauge comes with a rugged and durable structure that’s great for extended use. 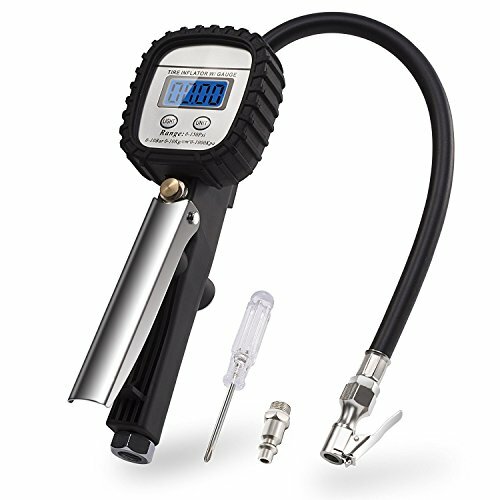 The design of the digital tire gauge air nozzle is in the form of a plug that allows for an easy connection to an inflatable pump, and this ergonomic design is very convenient to use. Exwell is a product that is suitable for all vehicles. The design of the tire pressure gauge, coupled with its wide range of measurements, makes it perfect for all types of vehicles, from construction trucks, sport utility vehicles, and cars, motorcycles, and bikes. No one wants their journey to be cut short by a deflated tire, so many people have a portable tire inflator gauge on hand. A major advantage of this product is that it’s easy to transport. Gone are the days of bulky and heavy inflators that have no added features. The modern tire inflator gauge comes with many add-ons that make the purchase a no-brainer. You just can’t beat a three-in-one device. If you are able to disconnect the fill hose on the 12V inflator, you might be able to attach it to the gauge. You probably don’t want to do that because the inflator sends all compressed air directly into the tire and that will cause the gauge to show the air pressure numbers jumping around instead of rising steadily. Yes. This product is designed to achieve the function of inflation, bleed and pressure detection by the valve spool stroke of upper and lower valve cover. Yes, you can use the product on your RV’s tires. It needs to be hooked to a compressor, but not an A/C compressor that compresses air. You can absolutely use it as a gauge without an air hose to test the tire pressure. The Exwell tire pressure gauge is an all-in-one solution that will offer peace of mind because you’ll know your tire pressures needs will be covered. The three-in-one feature provides you with the flexibility to handle all of your air pressure needs at an affordable price. Plus, you can be confident in the product’s reliability knowing that it comes with a three-year warranty has you covered. If you’re on the trail of a highly compact and accurate tire pressure gauge you can easily slip in the trunk or the glove compartment of your car, the Texton is a bright red beauty at a budget-friendly price. Measuring across 4 ranges for your complete convenience, get a quick and accurate reading on the go at an incredibly low price. 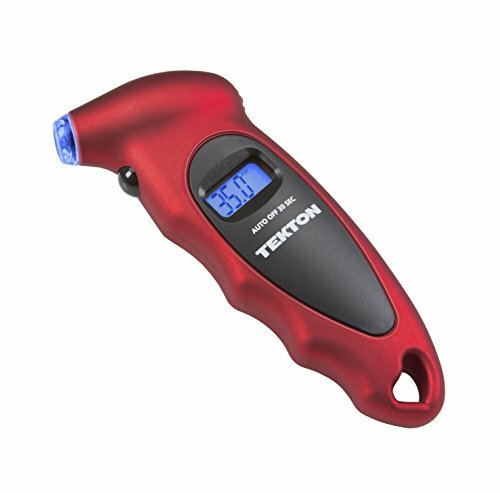 Keeping a great tire pressure gauge in the car is a smart move and with this ergonomic and well-designed model from Texton, you can cover your back without spending a fortune. You get a readout of pressure in your chosen range (PSI, Kg per cubic centimeter, Kpa, or bars. The display is lit making it perfect for use at night and the auto shut-off after 30 seconds does it part to conserve battery life. To power this gauge, you’ll need 1 x CR2032 3-V lithium coin cell and 3 x LR44 1.5-V button cells. Fitting neatly in the hand and taking up remarkably little by the way of storage space, there’s no excuse not to have a portable tire gauge with prices this low. If you’re looking for a hard-hitting pressure gauge man enough to take on trucks and RVs, Rhino offer a very cost-effective heavy-duty gauge. With a luminous dial and rock solid brass components, you won’t be disappointed with this gauge. 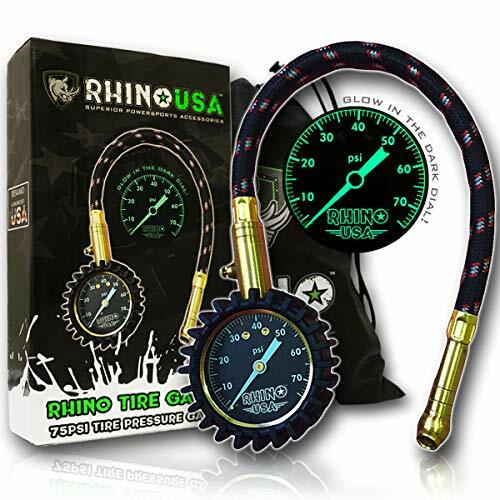 Rhino gives you everything you need and nothing that you don’t need with this no-nonsense 75 PSI tire pressure gauge. Pressure is displayed in PSI on an oversized dial that glows up blue allowing you to see clearly even in dim environments. The long cable lets you access the tire valve wherever it’s position so you can check away with the minimum of effort. Think closely in advance if the limitation of 75 PSI will prove restrictive rather than ending up underwhelmed. 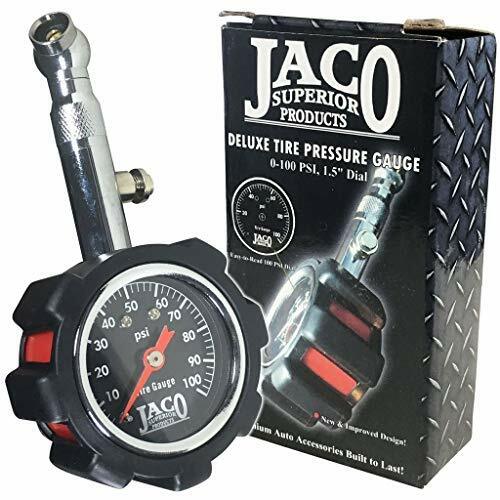 Looking like a supersized watch, this 100-PSI tire pressure gauge from JACO is an extremely accurate method of keeping track of the state of your boots. The clear dial displays pressure in PSI. This gauge is built to withstand some rough and tumble while continuing to deliver precise readings. The JACO gauge is an exercise in simplicity that all comes together in a highly accurate unit. The way in which the chuck is designed to move through a full 360 degrees means you can get onto the valves with ease wherever they’re positioned. You can reset the readings at the push of a button. An integrated bleeder valve brings down the pressure in tires that have been overinflated. Weighing just under 6oz and measuring up at 4.5” x 1” x 2”, this heavy-hitting gauge slips simply into the glove compartment or trunk when not in use. If you’re looking for a dependable and affordable pressure gauge, the JACO is tough to beat.